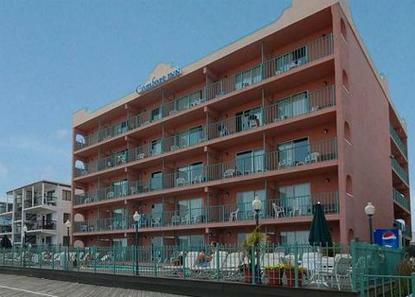 Oceanfront units available. Conveniently located on the Boardwalk. All units equipped with effeciencies. Indoor/outdoor pool on premises. Free deluxe continental breakfast. All rooms beautifully decorated. Credit Card required at Check Inn. Must have 1 adult 21 years or older in room. In Room Safe Charge: 1.50 per night. Children 12 and under stay free if sharing room with parents or grandparents, when no additional bedding is required. Parking: limit one space per room. Resort Fee: 4.00 per night. Rooms are located in two separate building.